I love eating food, I love cooking food, I love reading about food and I love looking at food. But can I be the only person who thinks there are far too many photos of chia pudding on Instagram? There – I’ve said it. That statement may make me wildly unpopular but frankly I’m becoming bored of the endless stream of ‘photogenic food’. Yes, food should look appetising, and yes, I applaud those who can take fantastic photographs (a skill I would love to learn one day as my camera is a total mystery to me!) But I don’t think how food looks should be anywhere near as important as how it tastes! I must declare a strong dislike for chia seeds and so they have taken the brunt of my rant – but really I am using chia pudding as an example for a whole range of ‘pretty but tasteless’ food. This seems to form part of a growing trend for ‘clean’ food and in some ways I think this is excellent – knowing what we are putting in our bodies is hugely important to me and I am very passionate about the provenance of my ingredients. However, replacing all known foods with ‘clean’ alternatives I find concerning, especially when children’s diets are involved. We have no allergies or intolerances in our family so we eat a balance of all food groups including whole grains, dairy and meat. When I replace an ingredient it isn’t to make my food ‘clean’ as if it was somehow ‘dirty’ before – its merely to try something new and provide my family with nutritious and varied meals. This tart is made with a sweet potato crust instead of pastry. This does make it lower in fat and calories, as well as increasing the vegetable content of the meal, but more than this, its delicious! 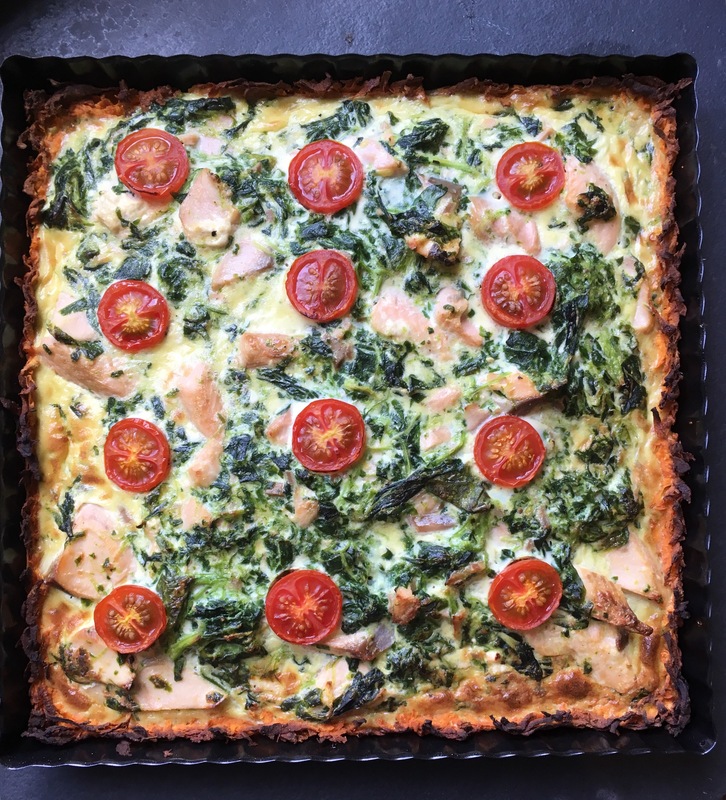 The sweetness of sweet potatoes works beautifully with the salmon and spinach in this tart and is a lovely alternative to pastry. I have tried sweet potato bases with various quiche and tart recipes but this has been my favourite so far. It is such a summery meal, perfect on warm evenings with a large salad. 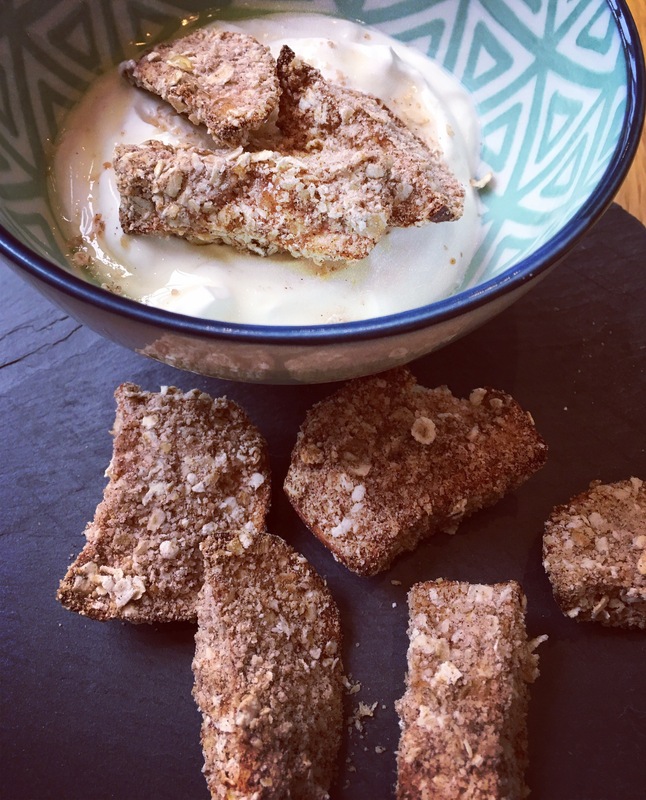 It also makes a brilliant baby-led weaning meal as it contains oily fish, green vegetables and dairy; in my experience often the hardest foods to get babies to eat! It can be eaten hot or cold, so it also works well for packed lunches. The recipe method looks a little long but if you are short on time I recommend making the tart case in advance. I normally make this in the morning, blind bake it and then keep it in the fridge until I need it later that day. This makes enough to serve 4 adults as part of a main meal. Using your hands or a spoon push the grated potato into the tart case, covering the base and sides. This can be a little fiddly, I find the best way is to use my hands and knuckles! Blind bake this a preheated oven at 180C for about 15 minutes until the edges are starting brown. Crack one of the eggs and put the yolk to the side. 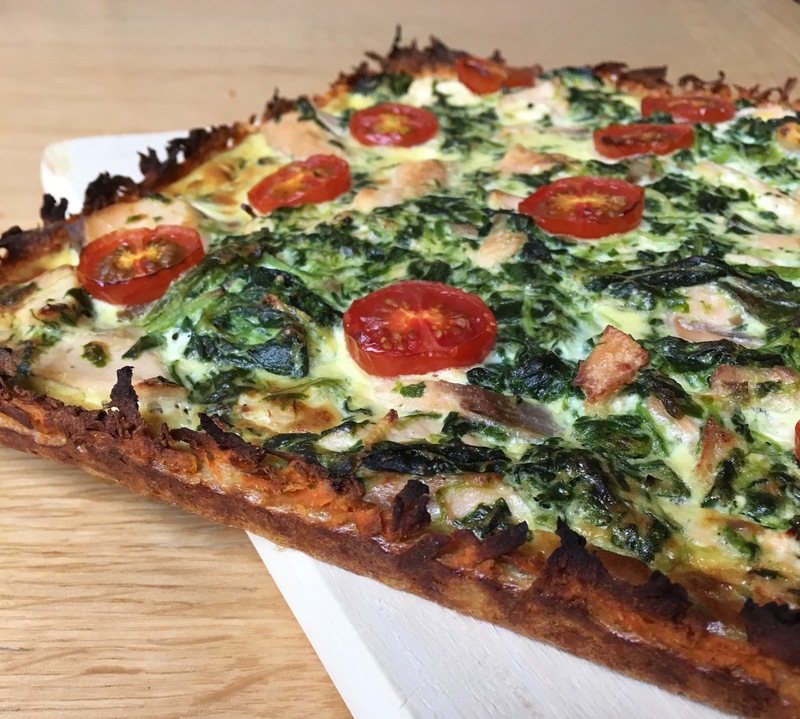 Using the egg white, brush the tart case to create and pop it back in the oven for 5 minutes. This creates a waterproof layer ensuring your salmon filling will not leak through. You cannot see or taste the egg white. Place the salmon fillets in a microwaveable dish with a little water and cook them for about 3 minutes, until they are cooked through. Cook your spinach, drain it and squeeze out any excess moisture and chop up. Add the salmon, spinach, creme fraiche and mustard to a bowl and stir. We enjoyed this warm last night with some new potatoes from our garden and a green salad with a citrus dressing to mirror the lemon in the tart. Will had his at lunch time cold and he ate it all (happy Mummy!) Despite the poorly taken photographs and the slightly browned black edges of the sweet potato case, this meal was made with love for my family and it tasted fantastic! I’d love to hear from you if you try any of my recipes, or if there are any people who have a recipe for chia seeds that may change my mind about them! One thing that I have definitely become better at since becoming a parent is time management. I’ve always been a bit of a control freak organised, but I now realise I was completely terrible at managing my time! I used to be very good at writing lists; long lists that were neatly written with little boxes to tick when I had done the task. Sounds ideal – but I would rarely, and by rarely I mean NEVER finish the list of jobs. Post-baby I still write a list every day, it’s normally scribbled on the back of an envelope with a coffee stain on, but most importantly I actually do what it says! William has been in a pretty steady two nap routine for a few months and this has made it relatively easy to be organised. It means I have two spells in the day to get things done. For my kitchen this means I need recipes that I can prep, at least in part, in advance. Most often I get the supper prep done in his morning nap as by the afternoon my enthusiasm can be dropping, or my house may have turned into a bomb-site! This summer vegetable minestrone is a perfect example of a supper that can be prepped in advanced and then cooked quickly when everyone is ready to eat. 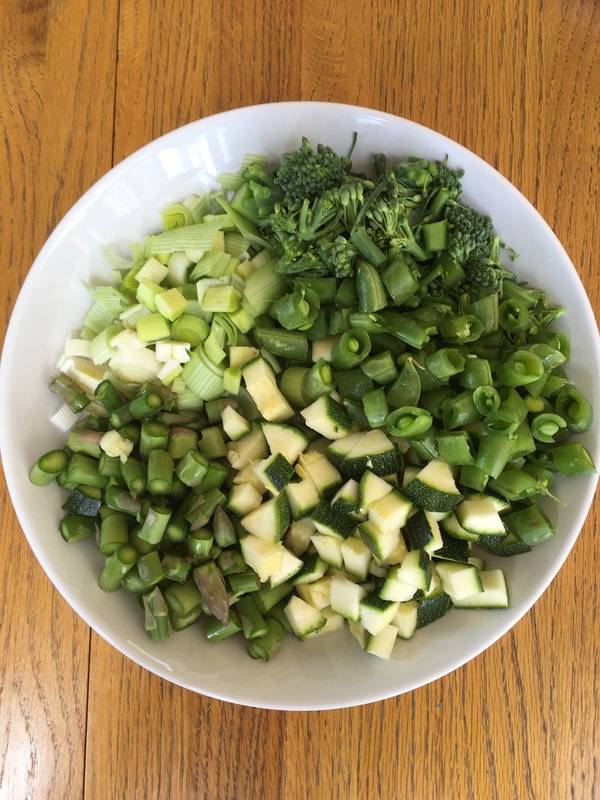 All of the summer vegetables in this soup need minimal cooking, it takes only 10 minutes to cook and in an ideal world would be eaten straight away as this way the vegetables keep their individual character, colour and texture. On the surface it may not sound that baby friendly, but all the prep work can be done beforehand, meaning when your little one goes to bed supper is only 10 minutes away. This soup is a wonderful way of getting vast quantities of green vegetables into your family. For Will, I blend his up to make a thicker soup as the chunks are currently too big for him to manage, but an alternative for baby led weaner’s would be to drain the liquid off the soup and just give them the vegetables as they are. The ingredient list may look long but don’t be put off, its really just a shopping list of green vegetables, and they can all be exchanged for others you may have in your fridge or freezer. The key is to not let it overcook. The other little trick in this soup is to add a parmesan rind; a trick I learnt from a Nigel Slater recipe. 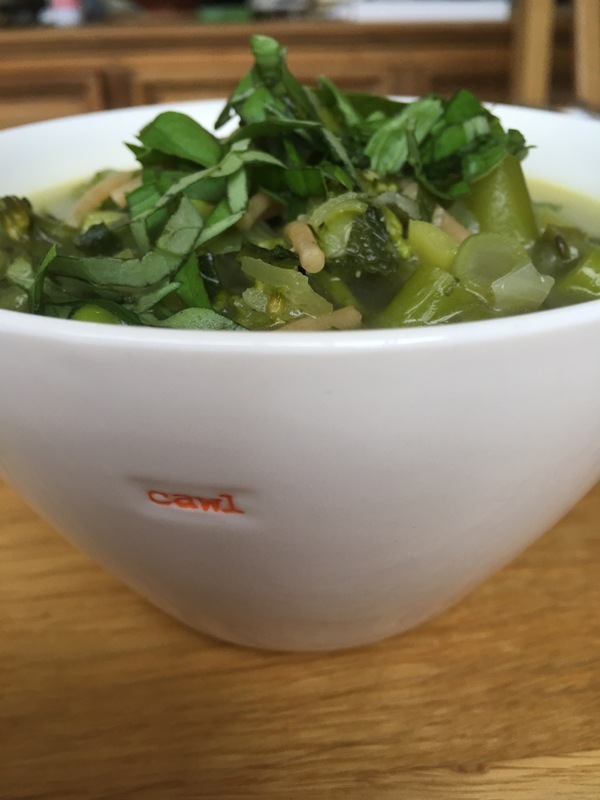 It works brilliantly with this soup to add a depth of flavour to the broth which would otherwise not be there owing to the soup cooking so quickly. It can be omitted but it does enhance the flavour. Adding pasta to the soup in the form of orzo or spaghetti (we use wholewheat spaghetti) makes it a filling supper on its own, but its also wonderful with some crusty bread and butter. 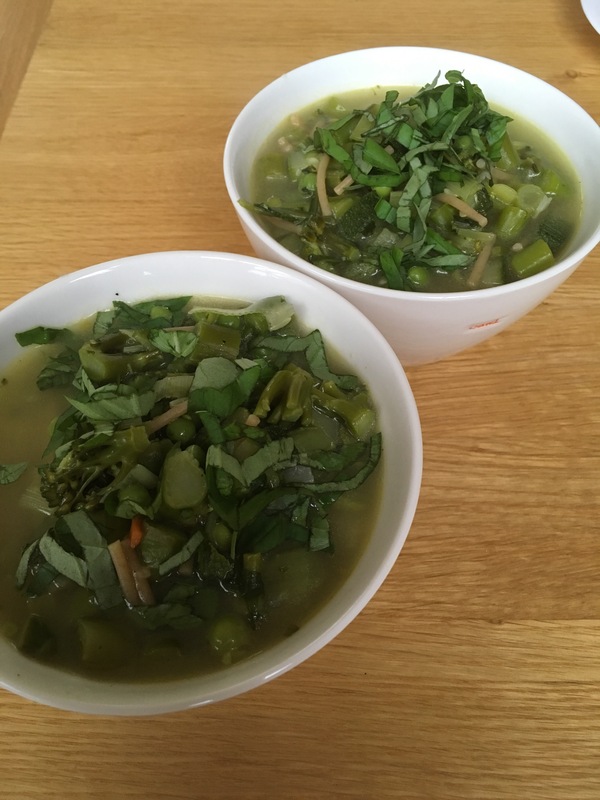 Soup may not seem that summery but I urge you to give this a try, it is a real celebration of all things green and sings summer! Chop all your fresh vegetables until they are the size of small cubes – try as much as possible to make everything a similar size. Add the vegetable stock (a cube works just fine in this soup, because I’m also cooking for William I use salt free stock), water (about 2 pints) and the parmesan rind. Leave to simmer on a medium heat. Cook for further 5 minutes until the vegetables are soft but still retaining their beautiful green colour. Remove the parmesan rind, ladle into bowls and garnish with the rest of the basil, enjoy! Will was born last summer and this meant I started weaning him in January- the 25th of January to be exact. Someone bought us a baby record book and I have thanked them so many times as I have written so much down that I would otherwise have forgotten in my sleep-deprived new Mum fog! I loved the process of introducing him to food, both as purees and finger foods, but I really struggled with fruit. Winter fruit in Britain is awful, or I should say winter fruit in Britain that babies can eat is awful! I tried, on a number of occasions to buy melons or strawberries but buying these fruits out of season is a futile exercise – they tasted of swede! It seemed that the only fruits on his menu for the first month or two were apples, pears and dried fruits such as figs, prunes and apricots. The other problem with winter fruit is that its not that suitable to eat as finger food. On numerous occasions I bought pears that actually went off before they became soft enough for my little one to gum, and raw apples were definitely not going to be suitable. Inspiration finally struck when I was making a crumble for a family lunch. It occurred to me that aside from at the sugar that most crumbles are filled with, it was a pretty baby-friendly pudding. I decided to deconstruct it and these apple crumble bites were the outcome. 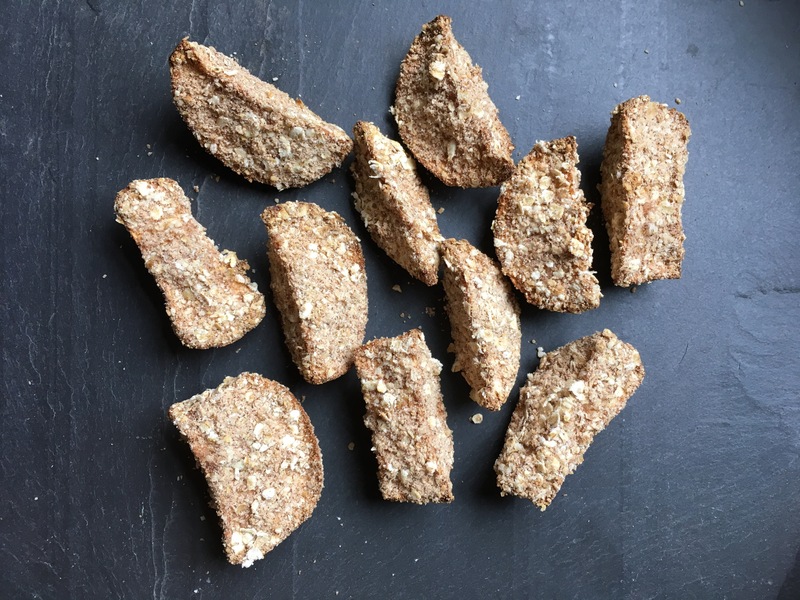 The apple is baked and therefore soft enough for young babies to gum or chew, whilst the crumble coating is sugar free yet delicious and turns the humble apple chunk into a really tasty pudding or snack. These have now become a staple make in my kitchen. I offer them to Will on their own, or as an edible spoon with a yoghurt or fruit puree dip. My husband and I enjoy them with yoghurt and maple syrup, on top of rice pudding (amazing) or even with a bowl of warm custard! They are lovely warm or cold and keep well in the fridge for 48 hours. The ingredients you need are limited, they are fast to make and healthy. They also increase the nutrient and calorie content of fruit for your little one- always good as they need plenty to keep them growing! After 5 minutes pull the apple out of the oven- it should be warmed through and ever so slightly damp, this will ensure the dry ingredients stick to it. Ensuring the apple isn’t too hot to touch, coat each slice in the dry ingredients and place on a lined baking tray or a cupcake tray. Bake at 180c for 15 minutes until the apple feels soft and the crumble coating is golden. Now that summer fruit is available I have been making these less. But I made them again the other day as the weather has turned really damp and grey here and we were all in need of something cozy for brunch. I fell in love with them all over again and had to share them with you. What are your favourite ways to use apples? I’d love to hear!